Ignorance is Bliss? | Tennessee Aircraft Services, Inc.
As a shop owner specializing in structural repairs, I often retrieve airplanes on Special Flight Permits that I’ve never flown or worked on previously. On these flights into the unknown, I am often amazed at the number and seriousness of the ignored maintenance items owners allow. These discrepancies predated the cause for me having to fly the plane and were accepted as tolerable by the owner. There is a pervading concept in the aircraft owner mentality that most maintenance should be deferred until an annual inspection. I learned in my previous life as an Avionics tech, that it isn’t the first problem that brings a airplane in the shop; it’s often the last one of several that finally inconvenienced the owner to the point he/she is compelled to have something done. If you have an indication in the cockpit that seems outside acceptable parameters, you should have it checked. A response from the mechanic along the lines of, “Don’t worry about it. It’s probably just an indicator problem” or “That’s just the way yours is, so don’t worry about it,” is cause for further investigation. Any diagnosis that terminates any further pursuit of a fix should be accompanied with a defendable reason. The bliss of ignoring signs of possible disaster may be short lived. A Cessna 210N had landed with one main gear not extended at an airport about 80 miles away from our shop. We were tasked with the recovery and repair. We traveled by ground and replaced the bent horizontal and elevator, taped the wing tip, and manually secured the main gear down locks in place. 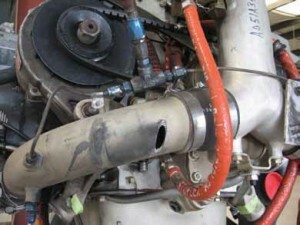 The plane was still within annual, and the owner said the plane had been flying well until the gear problem. I expected a short routine flight with the gear locked down. Initial ground engine runs showed no significant problems with the engine other than the failed alternator which was a part of the cause of the landing gear failure. Full throttle down the runway all still looked good. On climb through about 1K’ AGL, I noticed the CHT was moving toward the red line, and a scan of the other instruments also showed the fuel flow well below normal for full rich mixture. Lack of a proper engine monitor limited in-flight troubleshooting to manipulating mixture and throttle controls for indicator reactions. Already in a 180 degree turn back to the departure point, I’m watching the fuel flow continue to decrease and hoping my initial climb was sufficient to allow an on airport landing. Successfully back on the runway, the engine ran fine for taxi to the ramp. The indications on the gauges during the short flight pointed to a very lean mixture, but a quick look under the cowling didn’t show anything obvious like a massive fuel leak or an induction tube fallen off. We decided to start our search in the fuel system. We had already opened the fuel gascolator bowl and checked its screen before the first flight, so the next stop would be the screen in the fuel control. This screen should be removed, cleaned, and inspected at every annual inspection but is very often ignored. We cut the safety wire and unscrewed the screen at which time it usually falls out. No such luck. We had to forcibly pull the screen from the fuel control body. No residual fuel dripped out, and the screen was completely covered with fuzz and flakes of tank sealant. We turned on the fuel pump in a effort to see if fuel could run through. Initially nothing, then suddenly a wad of gunk fell out followed by a stream of fuel. That level of fuel restriction would certainly cause the engine to run lean. So, problem solved?? We checked a few other items to raise the pilot’s (me) confidence level in the plane’s ability to complete an 80 mile trip. I let it ride since we had only been hired to repair the landing damage. When the engine was removed for access to the lower firewall damage, we found the propeller control had cut a 1.5” long by 1/2” wide slot through the left induction pipe. Good Grief! I’ve never seen an induction leak this big. No wonder the engine was running so lean! Even at full rich it was just barely enough fuel to keep it running. Why would the classic indications of an induction leak be brushed off as merely an indication problem? 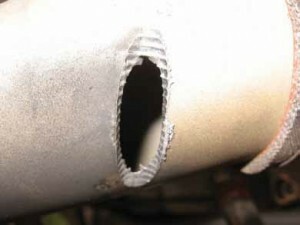 hole in induction system. A pressure test of the system would have discovered this leak . Grooves from the control cable clearly visible. This kind of damage takes a long time to occur. There are several excuses for brushing off a problem. In this case, the mechanics seemed to have no clue what would cause such indications and excused it as an indication anomaly. They were convincing enough for the owner to accept their story, even without evidence to back it up. The owner was a willing participant because the unsubstantiated diagnosis appeared to be the least expensive solution. The damage to the engine was long term and nearly certain premature failure of a cylinder or piston. There are many other examples of problem indicators often ignored by pilot/owners. These indicators apparently don’t present themselves as important enough to warrant urgent response. Whether ignored due to ignorance, misinformation, or arrogance, the danger is the same. During each annual and every preflight, the flight controls should be checked to ensure they travel fully to the stops. Proper adjustments to flight controls involve more than just tightening one turn buckle, and some mechanics often do not want to make the effort. Flight controls that operate to their full travel may very well be the difference in safe recovery from an unusual attitude and premature contact with terra firma. Damaged steering stops on the nose gear are a certain indication of stress to the rudder control system. The nose gear stops prevent the nose gear from pushing the rudder pedals past their limits. In turn, this prevents the pedals from pressing the rudder to its stop, then continuing past to overstress the cable. All of this overstressing is potentially damaging to several key components of the steering system. An inspection should be performed of all pulleys and pulley brackets, rudder stops, pedal torque bars, and links in the system. Then the nose gear stops should be repaired so you will know when the problem reoccurs. The original equipment oil pressure gauges are terribly antiquated but arguably the most reliable gauge in the airplane. Lycoming engines run at high pressure and low volume while Continental operates with low pressure and high volume, but both have a green arc on the gauge. Cruise pressure readings at proper operating temperatures should always be in the green. Anything outside the green at either end is cause for investigation. The typical magneto check at the end of the runway is a minimal check at best so you must listen when it tells you something about the engine. A good mag check should give about 75 RPM drop and all cylinder EGT readings should slightly increase. An engine monitor showing one cylinder going low while running on one mag will tell you exactly which spark plug or plug wire has failed. A rough running check with all cylinders still reading may indicate a magneto problem. Making these kinds of determinations are best done while still on the ground. Our Lycoming powered favorites have a particular propensity for sticking valves, often called morning sickness. The morning sickness is the forewarning of future possibilities. If ignored, it is a matter of when, not if, you will be cruising on a dark night in the clouds and the plane will give a strange shudder as if it suddenly got cold. The engine probably won’t quit, but certain personal bodily functions may temporarily fluctuate. A low cylinder compression check is not necessarily cause for alarm, but is reason for investigation. It could be the dreaded burned valve or just some carbon under the valve seat. Teledyne Continental and Textron Lycoming have service bulletins describing their recommendation on how to proceed if low cylinder compression is encountered. Don’t ignore symptoms until you have tangible evidence all is well. I sometimes mistakenly allow myself to revert to mechanic mode when flying. This is not a good thing as it causes me to spend too much time analyzing endless possible troubleshooting possibilities while ignoring the urgency of flying the plane. Retractable landing gear problems are a perfect example. When the under carriage doesn’t cycle properly or the lights don’t come on at the proper time, there is an amazing temptation to experiment. It’s rare for a problem to exist in flight and not be duplicative on jacks. For some reason we think cycling the gear just one more time will expose the problem with no thought of the very real probability they won’t extend. That’s going to be a pretty embarrassing discussion with the FAA and the insurance adjuster. If a doctor diagnosed you with some life threatening disease you’d at least expect an X ray, MRI, borescope, biopsy, or ultrasound to prove it. In this analogy, the doctor is the mechanic, the airplane is the patient, and you are the parent in charge. If the doctor suspects a problem, he/she should be able to defend the diagnosis with data. From the other point of view, if the parent (you) complains that junior (the plane) has a fever, you should expect more than a couple of aspirin and a kick out the door. Any suspected indication problem should be proven before the engine, airframe, fuel system, control system, or your life is put at risk.